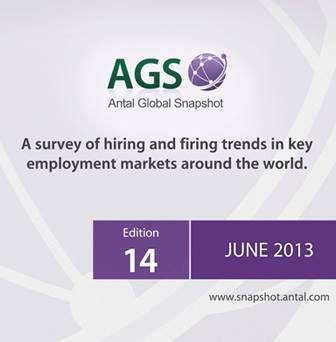 We’re delighted to announce that a new edition of Antal Global Snapshot has been released this morning. We asked 9923 companies in major markets such as western and eastern Europe, Africa, India, China and the USA whether they were currently hiring or firing at professional and managerial level. The survey then went on to identify if businesses planned to do so in the coming quarter. With the global economy showing sporadic signs of improvement, it’s encouraging that levels of managerial and professional recruitment have begun to creep up on the last editions of the Snapshot. Compared to a rather low level of hiring activity at the beginning of the year (46%), an encouraging 54% of respondents are currently hiring. So is there finally a light at the end of the tunnel for the global employment market? Many figures in this latest survey suggest that there are green shoots of employment positivity, but the future may hold a new set of challenges for organisations worldwide. Skills demand in the long term looks set to be hit with a possible shortage. Latest reports from the International Labour Office suggest that levels of youth unemployment are set to rise with an estimated 73 million young people likely to be unemployed in 2013. While this will not create an immediate problem, for organisations looking to source top managerial and professional talent further down the line, this could present a significant skills gap. With this in mind, it’s a slight concern that firing levels have begun to slowly creep up, with 19% of respondents currently letting staff go, up on the 16% reported at the beginning of the year. This level of firing is expected to continue in the coming months, with 18% expected to make job cuts. As organisations look to capitalise on growing global opportunities then, why has there been a rise in staff being let go? It’s perhaps difficult to create a complete picture, but reports from our network suggest that, having gone through an elongated period of doing more for less, many businesses are keen to refresh their senior level talent pipelines and gain further competitive advantages with new skills. It will be interesting to see how these figures compare in the next quarter, but for now it seems a positive future could be on the cards. Do download the full report, please click here.